Being that Hampton Roads is America's First Region, it's not hard to find a historic wedding venue that has ties to an early American president or someone significant in our country's young history. That's what makes July 4th a bit more special around here! Inspired by pretty vintage things and a very patriotic holiday, our latest inspiration board is all about modern spins on old world favorites with dashes of red, white, and blue. To help keep your Americana theme classy and away from cheesy, consider repeating the trio of colors throughout your wedding decor by mismatching patterns paired up with wooden textures. From checkered gingham bow ties, thick faded striped linens, to vintage china plates, you can keep everything perfectly patriotic with your color palette. Yummy strawberry lemonade spritzer cocktails keep guests refreshed while a bride can stay summery cool with a simple lace illusion necklace on her flowy gown. Practical and pretty are always the goals for summer weddings, so just add a little 'Merica in there for a truly memorable celebration! 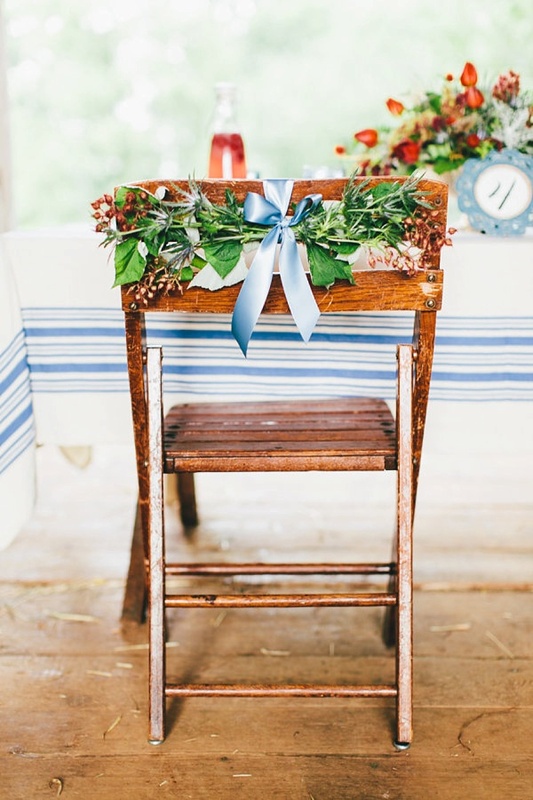 Can't get enough of Fourth of July wedding inspiration? Check out our Fireworks-Inspired Wedding Inspiration Board for some sparkle and glitter and this Patriotic Military Wedding Inspiration for some sky high ideas.